Daniel Foster | Tue, May 8, 2007 | Misc. Today’s post is written by Scott Lindsey, director of ministry relations for Logos, who is on the Bible Study Bus road trip. View more road trip photos at Flickror readScott’s first post from the trip. 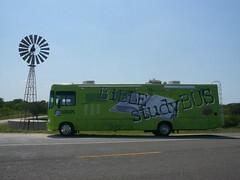 The Bible Study Bus is still trekking through Texas. Wow, is this a big state! We have been driving all around Texas for over 2 weeks now. It was so great to see so many old friends while we were in Abilene. My 11-year-old son, Beau, was born in Abilene. When he found out we had the Texas leg of the Road Trip he exclaimed, “I get to see my people! ?” Beau sure has loved the great BBQ we have been eating while in Texas. None has been better the feast we had with our friends, the Held family, at Harmon’s BBQ in Cibolo. If you are ever in the San Antonio area you have got to make this detour. Your mouth and belly will thank you for it! 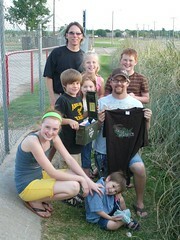 While in Abilene, we were able to introduce our friends, the Ganske Family, to the awesome hobby of Geocaching. We spent a Saturday venturing all over Abilene looking for geocaches. Geocaching is a treasure hunt using a handheld GPS. My family is hooked! We have done 14 geocaches while on the Bible Study Bus tour. The best part of geocaching for the kids is when they find a larger geocache that has small presents in them. The rule is: take something, leave something. We have left Logos coffee mugs, t-shirts, and Logos-branded, Bellingham roasted coffee as treasure for the next geocache discoverers. 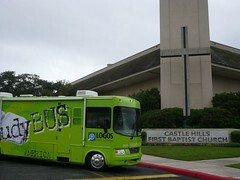 After Abilene we headed to San Antonio where we had the biggest Bible Study Bus event to date at Castle Hills First Baptist church. The drive down to San Antonio was all small country and farm roads. 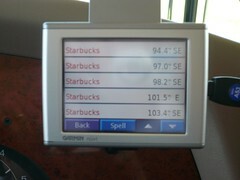 You know you are out in the middle of nowhere when the GPS in the RV shows that the nearest Starbucks is 94 miles away!!! I had to wait almost 3 hours for my caffeine fix. Just a few more weeks in Texas… hope to see you at a Bible Study Bus event soon!